Advantages: INEXPENSIVE WAY TO TEST LOTS OF PELLETS. I put together a test of lead-free pellets myself and spent over $200 getting the range of pellets together. Disadvantages: None really but I would like to see the wadcutter & HP pack available again. This is a MUST for anyone who wants to shoot straight and hit the target. I set a target 10 yards away, took my break-barrel and started shooting each type of pellet at a time. After shooting 6 pellets of the same kind I'd go to the target with a ruler to measure the spread between the farthest sides of the farthest holes. The results were amazing! While some 6-shot groups grouped to over an inch, others grouped to 3/4 inch, and one - Napier - to 1/4 inch. I never even heard of that brand but this collection allowed me to discover what is best for my gun! Advantages: Opens your eyes to what pellets are best for your gun - makes a huge difference in accuracy. This is THE best value you can buy in regards to finding the best pellet for your air rifle, hands down. you can spend 10-20$ on 1 kind of pellet and hope itll be accurate in your rifle. OR... just buy this. Advantages: it comes with 34 different kinds of pellets for the .177 pellet pack. all hand picked with no deformed pellets. Disadvantages: the pack that actually holds the pellets. watch the video and you'll see what im talking about. I think this is a tremendous value, considering all that you will learn with it. This was the best purchase ive made for my rifles. Advantages: Lets you try a ton of different pellets to determine if you should buy whole tins of them for less than the cost of 4 tins. 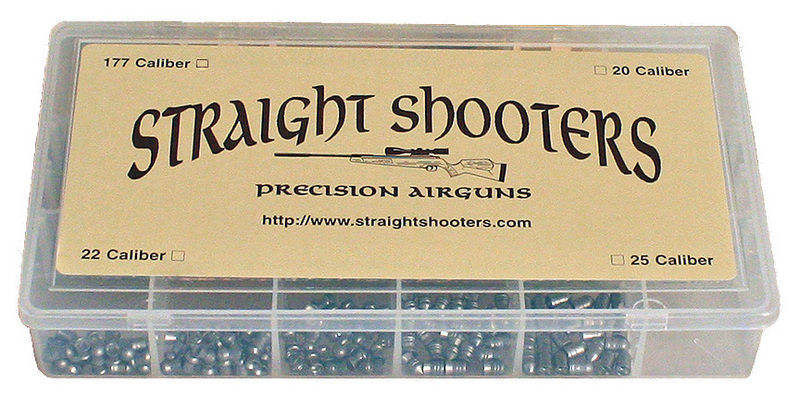 Disadvantages: The packaging that Straight shooters uses does a great job with respect to labeling each pellet/weight, but the plastic dividers are closely spaced making it hard to grab the pellets, I used tweezers to do it. Also the dividers that run across the pack are only pushed in so while handling the packs they will sometimes lift up allowing pellets in the same row to mix, and it takes some time to sort them all back out. other than that this the best sampler pack you can buy anywhere. The variety pack helped out tremendously trying to figure out which pellet my B3 and MTR77 liked best. I was beating my head against the wall for a good while before buying this. Advantages: Helps narrow down with pellet your gun likes best without having to buy a bunch of bulk pellets and wasting money.